This quilt panel is destined to be a Christmas wall hanging. The print is a large Christmas tree, decorated with teddies, cats, dolls and what-not. The plan is to make a quilt and add 30 machined buttonholes across the tree. The lights can then be fed through the button-holes, to "decorate" the tree (an idea borrowed from an example at our local Spotlight store). The kids are excited about the wall hanging. They helped choose the red backing and the polka dot binding. I drew the line when they tried to select the batting ... but then again they know about as much as I do about quilting (zero). Mr HB has been watching proceedings from afar. He seems oblivious to the fact that there could be significant furniture moves needed to create a Christmas feature wall. But as I make no secret of how slow my craft is, the furniture is probably the least of the worries. I am either starting this project quite early or very, very late. Mr HB might be safe until Christmas 2010. What a great idea Liesl. And very fancy-pants.... lights through the fabric. I am sure the looks you are getting from afar are sheer AWE at how clever you are! What a fab idea, love the bear panel! I too have left the christmas making way to late! 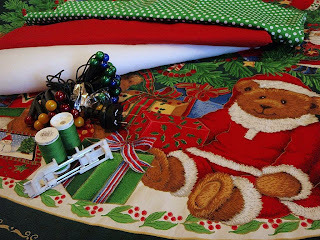 Why is it that we are compelled to pick up completely new forms of sewing/crafting in the crazy crazy run up to Christmas?! Meanwhile, I highly approve, and I LOVE the buttonhole idea. I love the idea of a Christmas Feature Wall!! Christmas craft, bring on the holiday's! This Christmas, next Christmas, either way it sounds like a very interesting idea and I'm looking forward to seeing what you create. Great idea - the lights through the wall hanging will look fab! Can't wait to see what it looks like - you can do it for Christmas 2009!! ...although the thought of sewing all those button holes makes me break out in a cold sweat. Christmas is such an exciting time - great for craft and wonderful getting the kids involved. They'll cherish these moments forever. it sounds very cool ~ can't wait to see it! So much fun to get the kids to help! There's always furniture movement around here for Christmas-we all need to showcase our "special stuff"!! What a great idea, would love to see your feature wall. Gah - Christmas posts! I do love Christmas, but it's sneaking up on me. Great idea though, and very popular with the kids I'm sure!